Pool & Spa Packages from Caribbean Pools! We are the swimming pool and spa building experts in Arizona. Have you always wanted a swimming pool and spa built in your backyard, but weren’t sure where to start? Let the team at Caribbean Pools make the process as simple as possible for you. We start by taking the time to understand what you want in your pool and spa and then build to match. We stand behind all swimming pool and spa packages and are positive you will love the results, too! When you contact Caribbean Pools, you will be taken care of every step of the way. We will come out to your home, help you plan for your backyard oasis, measure your yard, create a blueprint, refine and perfect those ideas with you. We then create a 3-dimensional moving visual model so you can see what the final result will look like when your vision comes to life, all with no charge to you. When we have created the ideal pool and you are ready to begin, we handle everything: from getting the permits to cleaning up after your backyard has turned into the dream vacation you envisioned. We even teach you how to keep it beautiful and clean all year long. We really will handle every aspect of the experience. All you have to do is jump in! Give us a call or contact us today to learn more about our Swimming Pool & Spa Packages! You can apply for Financing today through Paramount Pool Financing! The application process is simple and secure. If you have any questions, please contact us! Please take a moment and vote for us! 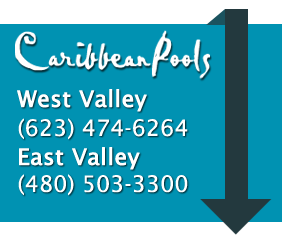 Enter “Caribbean Pools AZ”, and cast your vote.